Hog Island Country Store & Cottages is perfectly located for sightseeing in Michigan's Upper Peninsula. Located between Naubinway and Epoufette on U.S. 2, most attractions can be found within a short drive. 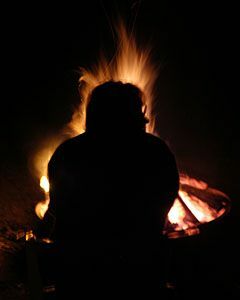 Of course we are pretty partial to our own attractions right here at the cottages and store; Campfires, sunsets and one of the nicest beaches in Michigan. 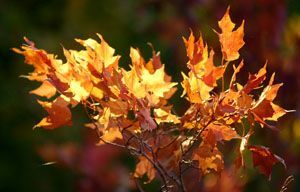 Fall is a magical time in the north woods. Our cottages are your jumping-off point to the deep woods of the U.P., with hidden treasures down every dirt road, and glowing colors lining U.S. 2. Take a literal step back into time at Fayette Historic State Park. This restored historic townsite near Fayette on the Big Bay de Noc of Lake Michigan is a fascinating tour of a bygone era. It was once the site of a company town that manufactured pig iron in huge brick kilns between 1867 and 1891. The town has been reconstructed into a living museum showing what life was like in this town in the late 1800's. The snail-shell harbor, surrounded by limestone bluffs, is a magnet for boaters and kayakers, and has a small marina. Plan to spend a day exploring the buildings, blacksmith shop, town hall, rustic trails and sand or stone beaches. GarLyn Zoo is a small "mom and pop" outfit set on a 30 acres of land. The zoo features native and exotic animals, and mulched trails that lead through the pine and birch forests in a park-like setting. 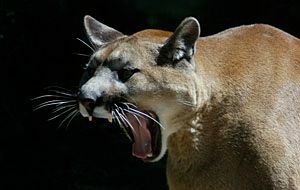 The zoo is surrounded by state and national forest lands. This is one the kids will remember — and so will you. Palms Book State Park contains Kitchi-iti-kipi, The Big Spring, a natural freshwater spring with a unique human-powered raft that is pulled across the clear, sparkling waters. The Big Spring is two hundred feet across and forty feet deep, but clear as a piece of glass. 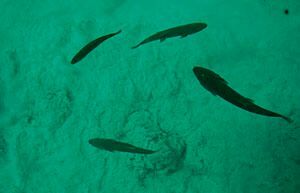 More than 10,000 gallons a minute "boil" up from the sandy bottom, at a constant 45 degrees in temperature. Old tree trunks, lime-encrusted branches and huge fish glide by the open-bottom raft that gives a safe, dry perch for families to observe the springs from above. 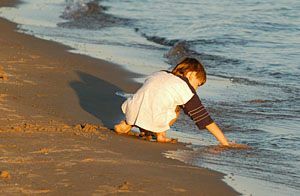 East or west of Hog Island Country Store & Cottages are some of the finest public, sand beaches in North America. 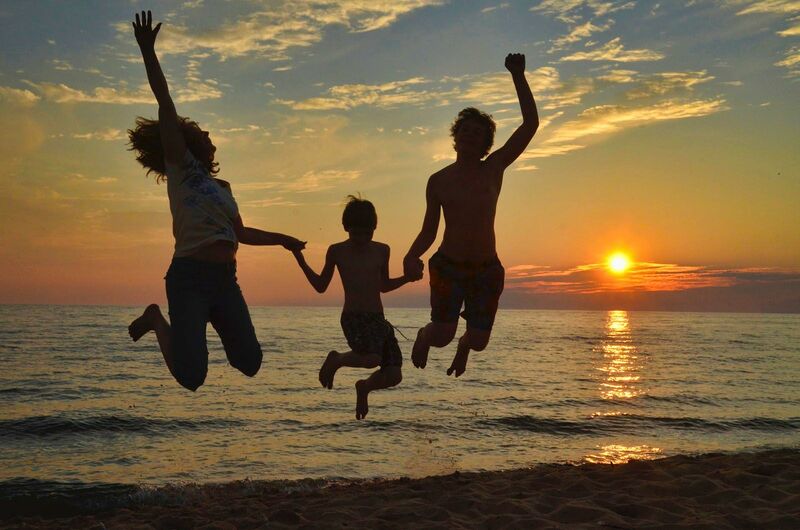 All along U.S. 2 are safe, convenient and uncrowded access points, where just a few short steps carry families or couples to their own slice of Lake Michigan heaven. 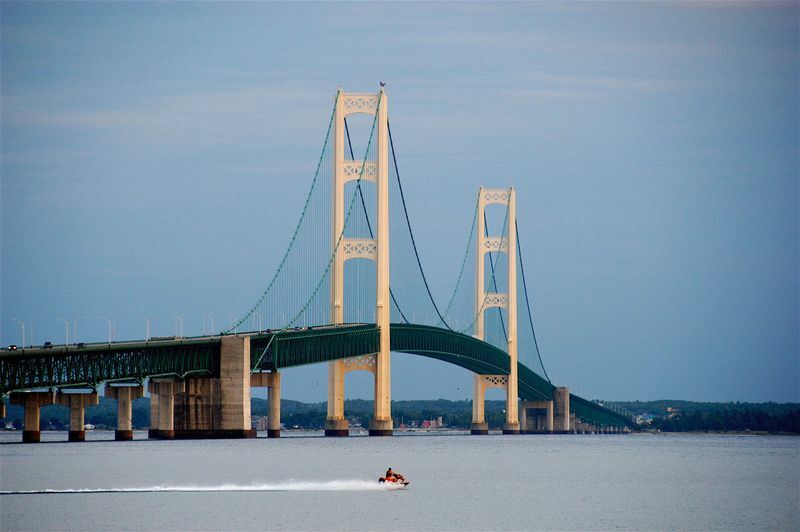 Just east of Hog Island Country Store & Cottages are the Straits of Mackinaw, offering all the conveniences of St. Ignace and Mackinaw City, as well as ferry access to Mackinac Island. 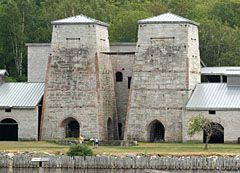 In addition, there are many historic attractions that make great day trips. West of Hog Island Country Store & Cottages is Manistique, a quaint little U.P. town with its own lighthouse and extensive boardwalk along Lake Michigan. Be sure and trek out on the breakwall to watch a spectacular sunrise or sunset. 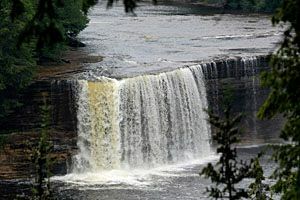 The Tahquamenon Falls have been entrancing Michigan families for decades. The unique brown, foamy falls — from the tannins in the cedar swamps that feed the river — often look like giant root beer floats. The upper falls are more than 200 feet across, drop some 50 feet, and can move as much as 50,000 gallons of water per second. The state park also has a microbrewery that serves lunches and dinners along with suds. The road to the falls is a scenic delight, and is well known to motorcyclists who measure their days in curves, not miles. 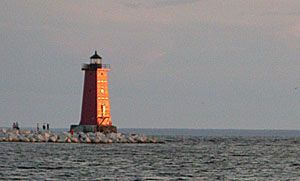 Seul Choix Point Lighthouse is located along a treacherous stretch of coast on Lake Michigan's northern coast. Its French name is "only choice", suggesting that it was used as a refuge by the early French traders in this area. The station was established in 1892 with a temporary light, and this light started service in 1895, and was fully automated in 1972. It is an active aid to navigation. There is now a museum at the light and both the building and the grounds are open for visitors from Memorial Day until the middle of October. "There is so much to do in the area that we never heard those dreaded words coming out of the mouths of our children: Mom, dad we're bored."